Aortic disease is a significant cause of death in developed countries. The most common aortic diseases are aneurysm, dissection and atheroma. The microstructure of the aortic medial tissue shows alteration of the quantity and/or architecture of the connective fibres (elastin and collagen) within the aortic wall, which directly imparts elasticity and strength, and leads to the mechanical and functional weakening associated with these conditions. 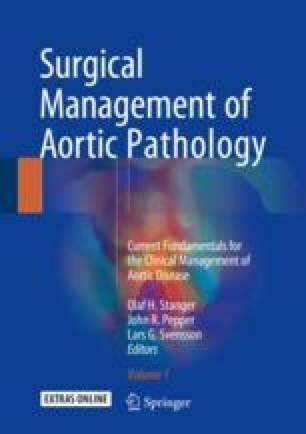 Three fundamental disease processes are responsible for medial disease, namely, atheroma, noninflammatory degeneration (aortopathy) and inflammatory aortitis of the media and adventitia, very often associated with many comorbid abnormalities that are discussed in this chapter.